Fast Fox is determined to have chicken for his supper. Mother Hen and her three chickens are looking for corn for their's. Fast Fox follows chickens and they follow his corn trail right into his supper sack! As Fast Fox hurries home, things look bad for chickens but Slow Dog saves the day by falling from his hammock and squashing fast Fox flat. Chicken, Chips and Peas is an enchanting picture book by the iconic British husband and wife picture book team Janet and Allan Ahlberg, creators of Peepo! Perfect as a bedtime story and for children learning to read! Fast Fox is determined to have chicken for his supper. Mother Hen and her three chickens are looking for corn for their's. Fast Fox follows the chickens and they follow his corn trail right into his supper sack! As Fast Fox hurries home, things look bad for the chickens but Slow Dog saves the day by falling from his hammock and squashing fast Fox flat! 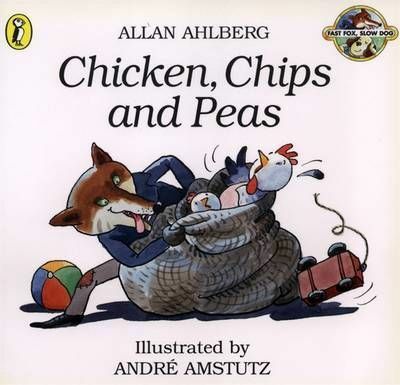 The chicks eat Fast Fox's corn, Slow Dog gets a biscuit from Mother Hen and Fast Fox has a miserable meal of chips and peas. Allan Ahlberg has published over 100 children's books and with his late wife Janet, created many award-winning children's picture books, including It Was a Dark and Stormy Night, Funnybones, Each Peach Pear Plum and the Kate Greenaway Medal winning The Jolly Postman.